Digital Intraoral X-Rays are the most common type of X-rays associated with dental visits. These allow the dentist to look for cavities and check the health of your teeth as well as the surrounding area. Intraoral X-rays are detail orienteted and allow your dentist to focus on specific problems that extraoral X-rays cannot detect. Images taken involve showing the upper and lower teeth in one area of the mouth. The images involve the crown of each tooth down to the supporting jaw structure. They are primarily used to find decay in teeth as well as changes in bone density over time that may be caused by gum disease. An image of the whole tooth from the crown to the jaw. Typically used to detect differences in root or bone structure. 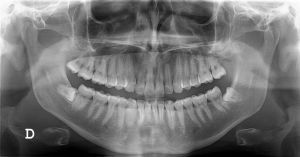 A larger X-ray which involves being able to see and evaluate the arc of teeth in the upper or lower jaw.